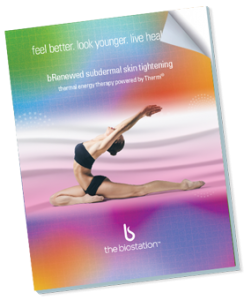 discover our non-surgical solution for total body skin firming. Your guide to safe, effective thermal energy subdermal skin tightening. Want liposuction-like results without having to undergo the pain, recovery and scarring of surgery? bRenewed thermal energy subdermal skin tightening safely, painlessly and effectively firms and tightens skin on the chin, under arms, stomach, thighs and knees, without the need for invasive, costly surgery that can leave unsightly scars. This procedure is also ideal for tightening loose skin all over the body after liposuction.